Cenpatico Integrated Care manages the Medicaid health plan (physical health and behavioral health) for people with serious mental illnesses, as well as the behavioral health benefits for people with general mental health concerns and addiction disorders. 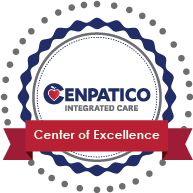 Cenpatico IC is the Regional Behavioral Health Authority for the entire south part of the state. The transition to Cenpatico Integrated Care comes, also, with a state-wide transition to a rollout of Integrated Care for Medicaid/AHCCCS members with serious mental illnesses. On October 1, CODAC began offering physical health care in our four large outpatient treatment centers. We will continue the co-located primary care with El Rio Community Health Center at our Alvernon treatment center. We are excited to welcome new primary care providers to Team CODAC. They treat common illnesses and injuries, conduct physicals and wellness screenings, and diagnose and monitor chronic medical conditions like diabetes and high blood pressure. They work under the same roof as our psychiatrists, nurses, medical assistants, therapists, case managers and peer supports to treat the whole person. The close coordination of physical health care and mental health care is critical for the wellness of our clients. As you know, physical health impacts your emotional health. And mental health impacts your physical health. We’ll be coordinating the whole wellness of our members and you will feel the difference! Click here to visit Cenpatico’s website.